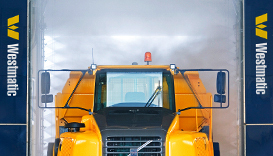 Westmatic's Touchless, specialty wash systems are ideally suited for large, heavy-duty vehicles which require intense cleaning and decontamination. 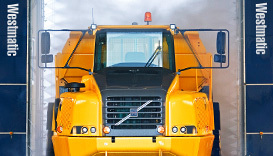 The Touchless wash system is perfect for irregular shaped large vehicles and equipment such as military vehicles, heavy equipment, garbage trucks, tanker trucks, mining equipment and fleets of mixed vehicles. 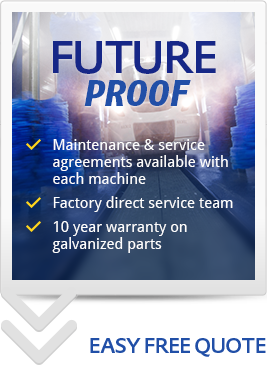 Westmatic offers the widest range of mining vehicle wash equipment in the industry! Our wash systems are available in completely friction (brush) wash systems, completely touchless wash systems, and Hybrid combination (brush and touchless) wash system. Westmatic's touchless wash systems utilize robotic high-pressure arches to provide a consistent, brilliant wash result. The robotic arches will wash the front, rear, and sides of the vehicle constantly self-adjusting to different widths and irregularities of heavy vehicles and equipment. This is achieved safely and effectively through the system's Automatic Vehicle Sizing/Contouring System.